More correct to say bulldozed through against the Constitution. The Dewan Rakyat has passed the motion on the redelineation of electoral boundaries after MPs from both sides debated for some two hours, on a day that saw protests against the plan outside the Parliament building. There were 129 MPs who voted in support of the motion, and 80 who opposed it. 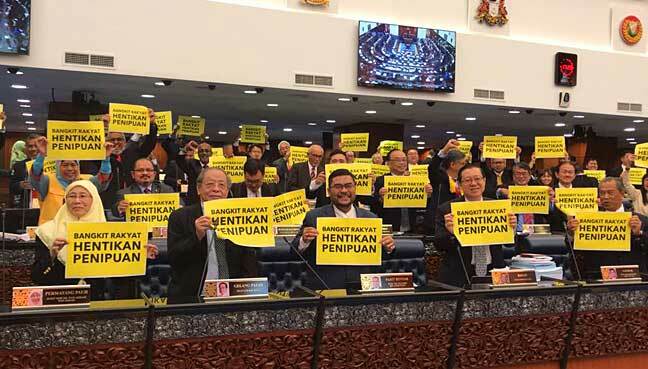 Earlier, seven MPs from each side were allocated 10 minutes each to debate the motion, which has drawn strong protests from the opposition and electoral reforms coalition Bersih 2.0. As Speaker Pandikar Amin Mulia announced the result, opposition MPs carried placards with the words “Bangkit Rakyat, Hentikan Penipuan” (People Arise, Stop the Cheating). Earlier, Prime Minister Najib Razak tabled the motion as hundreds gathered outside the Parliament building. Several representatives from Bersih later handed over a memorandum urging Pandikar to stop the tabling of the motion, citing pending legal suits as well as procedural lapses on the part of the EC. Some of the protesters were involved in scuffles with police who formed a barricade around the complex. 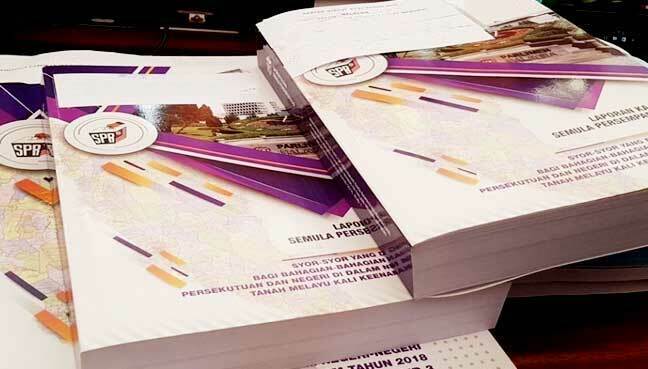 In tabling the bill, Najib said the EC’s recommendations did not propose any change to the number of parliamentary and state constituencies but only suggested renaming 12 parliamentary and 28 state seats. There are a total of 222 parliamentary seats and 587 state seats. The last time Parliament approved a revision to the electoral boundaries was in 2003. According to the Federal Constitution, a review is necessary at least once every eight years. PETALING JAYA: The Malaysian Bar, in a strongly worded statement, today condemned the constituency redelineation proposals passed by the Dewan Rakyat on March 28 as “fundamentally flawed, inherently unfair and unconstitutional”. The statement, issued by Bar president George Varughese, was critical of the Election Commission (EC), judicial decisions and Dewan Rakyat Speaker Pandikar Amin Mulia. “The redelineation proposals are being implemented for the imminent 14th general election (GE14). “By disrespecting and totally disregarding the principle of ‘one person, one vote, one value’, the proposals are fundamentally flawed. “The inherent unfairness, and unconstitutionality, of the redelineation exercise and its results may well cast a long and deep shadow over the legitimacy of the outcome of (GE14), as well as future general elections,” the statement said. The order relating to the 2018 redelineation exercise was adopted by the Dewan Rakyat last Wednesday, and then submitted to the Yang Di-Pertuan Agong who gave his assent. Following this, it was published in the Federal Government Gazette, and made effective immediately. The Bar said the process was completed “in the short space of 24 hours”. Analysts and the opposition denounced the constituency boundary changes as designed to favour a Barisan Nasional victory in GE14. The statement said the Malaysian Bar is “deeply disturbed” by the overall manner in which the redelineation exercise was conducted by the EC. It said there was “indecent haste” in tabling and passing the redelineation proposals by the Dewan Rakyat. The redelineation exercise was dogged by procedural issues from the very beginning, starting with the presentation of the redelineation exercise proposals for Sarawak for public review in January 2015. When the proposals were challenged, the High Court of Sabah and Sarawak at Kuching ruled that the preliminary information provided in the EC’s public notice was insufficient. This finding was, however, reversed by the Court of Appeal. The Federal Court in turn refused to grant leave to appeal, on the ground that the proposals had, by then, already been submitted to the prime minister. “The same concerns spilled over once the redelineation exercise was commenced for Peninsular Malaysia, with questions raised about the adequacy of the preliminary information, rejection of some of the objections on procedural grounds, rush of the first round of the local inquiry, refusal to allow objectors to fully ventilate their objections, denial of the right for legal counsel to be present, and refusal to hear some objectors during the second round of the local inquiry,” the statement said. “The Malaysian Bar is also appalled by some of the judicial pronouncements taken in the various legal challenges made in the course of this electoral redelineation process. “The courts appear to have denied litigants access to a legal remedy and, in so doing, failed to protect and uphold the Federal Constitution. “In particular, the decision of the Federal Court on Feb 19, 2018 — involving applications brought by two opposition Members of Parliament from Perak and seven voters from Melaka — where it was held that the proposals of the EC could not be judicially reviewed, because they were actions of the EC that did not bind parties, was astounding. The Malaysian Bar described the position as “wholly untenable”. On parliamentary procedure, the Malaysian Bar said it fully supports the fact that the doctrine of separation of powers is a feature of the Federal Constitution, as most recently reaffirmed by the Federal Court in the cases of Semenyih Jaya v Pentadbir Tanah Daerah Hulu Langat and Indira Gandhi a/p Mutho v Pengarah Jabatan Agama Islam Perak. Applying the principle to this situation, Parliament is the master of its own affairs, it said. “However, if there is to be a real respect for the doctrine of separation of powers, and not mere tokenism, then the Legislative branch of government must not only be independent, but must be seen to be independent. “It should not bow or tie itself to the Executive branch, and must oppose any attempt by the Executive branch to rush through legislation to meet the latter’s own political agenda and timetable. “The Speaker of the Dewan Rakyat should not act in a manner as to give rise to the irresistible impression that Parliament was but a mere rubber stamp for the exigencies of the Executive branch. The statement recalled the Speaker’s own ruling earlier in the year that a debate on the 1MDB issue could not proceed — on the ground it was the subject of court proceedings in the United States of America and therefore “sub judice”. It said this is hard to reconcile with his recent ruling that debating the EC’s redelineation proposals — although the subject of court proceedings in Malaysia — was not “sub judice” and could therefore proceed. “This inconsistency is an abuse of the rule of law,” the statement said. On the issue of constituency size, the Malaysian Bar said that after 60 years of independence, it is incredible that the variation between the smallest and largest seat (by voter size) in Parliament has actually increased over time, rather than decreased. “In the 2018 redelineation exercise, the largest constituency will be the renamed Damansara seat in Selangor, with 150,439 voters, which is 8.53 times larger than the smallest constituency, the Federal Territory of Putrajaya, with 17,627 voters,” it said. Even comparing within states, the variations remain huge. “In Selangor, the difference between Damansara and the constituency of Sabak Bernam with 37,126 voters, is 4.05 times, the highest in any single state in Peninsular Malaysia. “For this to be occurring in Selangor, arguably the most developed state in Peninsular Malaysia, is incredible.